Let’s celebrate! Join us as we toast alumni and students who are changing our world through natural medicine. 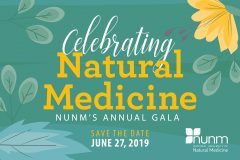 NUNM’s annual Gala will take place on June 27, 2019 at downtown Portland’s stunning architectural treasure, the Sentinel Hotel. This festive event features a cocktail party, silent auction, games, and a delicious meal catered by Jake’s at Sentinel. You’ll hear inspirational speeches by NUNM students and faculty as well as keynote speaker, soulful storyteller, and dynamic performer, Will Hornyak. The evening culminates with a dance party! Your participation will have a lifetime impact on students, as all proceeds benefit tuition scholarships at NUNM, ensuring the opportunity for academic success for all. Purchase your 2019 gala tickets here! Unable to attend the celebration, but would still like to contribute? Make a donation now. Have questions or need more info? Contact Elysia Nelson at 503.552.1540. We appreciate your support!